The R&S®VENICE PLAY software application was designed to simplify your life in hectic studio and live situations. R&S®VENICE PLAY provides clarity when managing multiple channels for studio and production playout applications. With R&S®VENICE PLAY, you have full control of rapidly changing playouts even when things get hectic. R&S®VENICE PLAY can be installed on multiple client systems, providing redundant control of all playout processes. If problems arise, all playouts can be controlled from another R&S®VENICE PLAY application without interruption. The user-friendly interface lets you control multiple playout channels in parallel without having to switch between individual tabs or applications, saving you valuable time. Multiple channels can be combined into a single playlist to obtain a comprehensive overview. Clips designated for playout can be organized into rundown lists and stories. 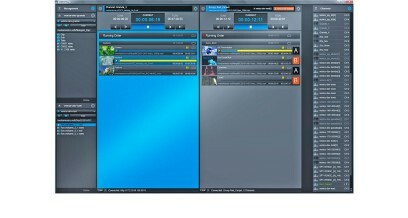 Last-second changes in the playout can be made during the playout process. The integrated head and tail editor permits last-second changes so you can meet even the tightest of deadlines. The clips planned for playout are clearly displayed in a preview screen that you can configure to meet your needs. All clips, stories and even entire rundowns can be played back sequentially or individually in a loop. A configurable visual counter counts down the seconds until the end of the playout, providing correct time indexing at the end of the playout. A subset of the innovative Spycer data management tool is integrated into R&S®VENICE PLAY, making it possible to add clips with a simple drag and drop. You have direct access to a variety of data management functions without having to switch between applications. And thanks to the proprietary R&S®VENICE hardware scaler, content in different resolutions and formats can be combined into a single playlist and then played out. All R&S®VENICE channels in the network are automatically detected via multicast. Configuration via static IP address is naturally also possible. All recognized or new R&S®VENICE channels can be added to the monitoring application via drag and drop.